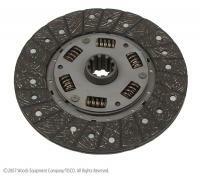 8N7550 Years:1939-57 Clutch disc, 9", spring loaded, with woven heavy duty facings, 10 spline, 1-3/8" hub. Tractors: 9N, 2N, 8N, NAA (4-speed), 600, 700, 800, 900 (prior to s/n 14257, 1953 to 1957). 8N7563KIT Years:1939-57 Clutch Kit, 9 Inch For 9N,2N,8N,NAA,600,700,800,900.